The Newark Museum will mark the opening of a new special exhibition gallery and its newly reopened Washington Street entrance with a major exhibition featuring Hudson River School landscape paintings from the permanent collection, as well as private and public collections. The Rockies and Alps will introduce old and new audiences alike to the great beauty of these extraordinary landscapes. The Newark Museum will mark the opening of a new special exhibition gallery and its newly reopened Washington Street entrance with a major exhibition featuring Hudson River School landscape paintings from the permanent collection and major loans from private and public collections. The exhibition is on view March 24 through August 19. The Rockies and the Alps: Bierstadt, Calame, and the Romance of the Mountains presents a unique interdisciplinary and transnational view of alpine landscape art and culture in the United States and Europe. The exhibition is comprised of more than 70 rarely exhibited paintings, prints, drawings and photographs, showcasing Newark’s renowned landscape painting collection in context with loans from more than twenty distinguished private and public collections. Tracing mountain painting from early works by J. M. W. Turner and John Ruskin to John Singer Sargent’s camping scenes in the Canadian Rockies, The Rockies and the Alps treats visitors to an extraordinary array of mountain scenes painted by some of America’s most celebrated landscape artists—including Albert Bierstadt, Frederic Church and Thomas Cole—and highlights the influence of the Swiss Alpine master Alexandre Calame and his circle. The exhibition is co-curated by Katherine Manthorne, a leading scholar of 19th-century landscape painting, and Tricia Laughlin Bloom, Ph.D., Curator of American Art at the Newark Museum. 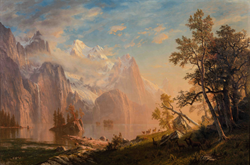 With thematic galleries highlighting literature, natural science, technology and tourism, the exhibition presents alpine painting as part of a widespread fascination with mountains in the 19th century, when both the United States and Switzerland were still developing a national identity. Albert Bierstadt traveled to the Alps for the first time in 1853, just prior to creating his grand paintings of the American West. The importance of European excursions for Bierstadt and many other American artists has been long noted, but this exhibition and the related catalogue marks the first time that an international perspective on American landscape painting has been so broadly and thoroughly investigated. A highlight of the exhibition and perhaps a discovery for many American audiences will be a rare selection of paintings by Alexandre Calame, the influential leader of the Swiss Alpine school, whose role in capturing the Swiss landscape is comparable to Albert Bierstadt’s reputation as painter of the American West. Calame’s Alpine paintings feature sweeping vistas of mountain torrents and renderings of the high altitude terrain where he spent every summer painting. Just as Bierstadt’s paintings shared the wonders of America’s West, Calame’s depictions of Alpine peaks, lakes, and waterfalls revealed the majesty of the Swiss Alps to international audiences. With more than 40 artists represented, The Rockies and Alps highlights the role of early landscape artists as explorers, who often made their rugged trips into the wilderness as members of government-supported survey expeditions. The exhibition includes a wealth of artists’ sketchbooks, travel literature, postcards, stereoscopes and magic lantern slides, illuminating how the imagery recorded by landscape artists was influenced by mass culture and how their imagery was disseminated to mass audiences. One example is a finely detailed sketchbook by Sanford Robinson Gifford on loan from a private collection, which is being shown for the first time to the public. The scientific interest many artists took in recording the natural environment extended to documenting the original inhabitants of these landscapes, and a selection of images of Native Americans points to the treatment of indigenous people as mere components of the landscape by European-American artists. A popular Currier & Ives print by Francis Flora Bond Palmer, for instance, depicts emigrants traveling west, with generalized Native American figures looking on. “This encyclopedic approach to mountain painting, exploring broadly what the landscape meant in the 19th century, not only allows us to showcase the Museum’s diverse collections, it fits in conceptually with the themes found in our Seeing America galleries,” notes Bloom. Currently on view in Newark’s 19th-century landscape gallery, a related exhibition brings together historical and contemporary landscape imagery and prompts visitors to consider how historical landscape paintings reinforced dominant colonialist narratives. Part of Seeing America, the reinstallation of the permanent collection begun in 2016, Vantage Points features Bierstadt’s monumental painting The Landing of Columbus in context with a hide painting by Chief Washakie, a revered 19th-century Shoshone leader and Bierstadt’s contemporary, as well as recent works by Brooklyn artist Kenseth Armstead and Santa Fe artist Michael Namingha (Hopi-Tewa). Both Armstead and Namingha recast conventional images of the American landscape to question historical narratives about race, power, war and the environment. The Newark Museum and Giles, Ltd. have co-published a fully illustrated catalogue in conjunction with The Rockies and the Alps, with original contributions by Katherine Manthorne, Tricia Laughlin Bloom, Patricia Mainardi and James Saslow. The catalogue is available in the Museum Shop. Major support for The Rockies and Alps is provided by the PSN Family Charitable Trust and Beverly K. Nadler. This project is supported in part by an award from the National Endowment for the Arts. Additional support is provided by George Robb, Barbara Brous, Eleonore Kessler Cohen and Max Insel Cohen, Mary and Raymond Courtien, Ellen and Don Greenfield, Judy Lieberman, The Marie and Joe Melone Exhibition Fund for American Art, and anonymous donors. For additional information, follow the Museum on Facebook at facebook.com/newark.museum or Twitter at twitter.com/newarkmuseum; or by visiting http://www.newarkmuseum.org.